At the end of the 1800s, the Polish population of Buffalo neared 80,000. Many of these Poles lived in tenement conditions, with four, five, or six families to a house and personal hygiene was an issue Heath Commissioner Wende was concerned with. In 1897, Buffalo opened a free public bath house on the Terrace which found great success in the nearby Italian tenement. With that, Commissioner Wende began laying down the ground work for a second free bathhouse to be located in the Polish district. The project began slowly when a corner lot at Stanislaus Street and Woltz Avenue was purchased in 1898. In March of the next year, Alderman Frank Cwiklinski earmarked $15,000 in the budget for the project and Buffalo Bath House No. 2 was born. The architectural firm of Lansing & Beierl was hired to design the house and construction began in early 1900. As the building was being finished Michael Lauber was named Keeper of the House with Michael Wozniak as his assistant. 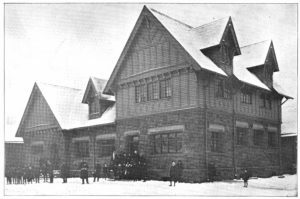 On January 2, 1901, the new bath house was formally opened and 350 people used the facility that first day. Open from 7:00 AM to 9:00 PM, the brick and stone frame structure was outfitted with 18 individual showers, nine rain baths in three apartments, and one bathtub. The building was also separated into two sections, one for the men and the other for the women, allowing each a 20 minute shower. The new bath house was extremely popular with the Poles; in the first 15 days nearly 5,000 people used the baths exceeding both Health Department’s expectations and budget. Soon more money was allocated for supplies and assistants. With its size and popularity the bath house quickly became a community center. This allowed to city to save money by transferring the East Side vaccination station there and opening it as a polling place for elections. As housing became more available the necessity of the bath houses diminished. In the 1940s Stanley Molik became keeper of House No. 2 and although improvements were made, attendance declined. On July 1, 1962 the city of Buffalo closed down the bath houses and required all city apartments to have baths. This led to some unintended consequence as renters like Henry Bauman of 94 Woltz Avenue were forced to move, often to the suburbs taking their rent money with them. Now with a piece of unused property in the heart of the East Side, the city decided to erect Senior Center for the aging Polish population. On March 3, 1969, the Ulinski Senior Center, named in honor of parks commissioner, Common Council president and International Boundary Commission member, John A. Ulinski was dedicated. In 2015, the building was home to Buffalo Markaz Masjid. "Aldermen at Odds with Organization." Buffalo Evening News [Buffalo, NY] 11 Feb. 1902: 6. Print. 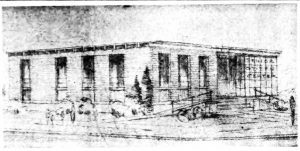 "An Artist's Drawing of Proposed Senior Citizens Center." Buffalo Courier-Express [Buffalo, NY] 2 Nov. 1967: 5. Print. "Anxious To Hurry The Bill Through." Buffalo Evening News [Buffalo, NY] 27 Mar. 1899: 1. Print. "Bath Houses to Close." Buffalo Courier-Express [Buffalo, NY] 19 Apr. 1962: 7. Print. "Bathhouse Ordered Reopened by Council." Buffalo Courier-Express[Buffalo, NY] 21 Sept. 1962: 7. Print. "Center Dedicated." Buffalo Courier-Express [Buffalo, NY] 3 Mar. 1969: 13. Print. DeForest, Robert W. The Tenement House Problem: Including the Report of the New York State Tenement House Committee of 1900 ; by Various Writers. Vol. II. New York: Macmillan, 1903. Print. "DEPARTMENT OF PUBLIC WORKS. BUFFALO, N. Y., Oct. 18, 1899. "Buffalo Evening News [Buffalo, NY] 26 Oct. 1899: 10. Print. "East Side Residents Demand New Bath House." Buffalo Courier [Buffalo, NY] 15 Mar. 1914: 68. Print. "Keepers Named For New Bathhouse." Buffalo Courier [Buffalo, NY] 13 Nov. 1900: n. pag. Print. "Makes Plea For New Public Bath Houses." Buffalo Courier [Buffalo, NY] 26 July 1916: 3. Print. "Many Use City Baths." Buffalo Courier-Express [Buffalo, NY] 17 Jan. 1929: 1. Print. "Molik to Take City Clerkship In Near Future." Buffalo Courier-Express[Buffalo, NY] 27 Nov. 1957: 2. Print. "Nearly 82,000 Free Baths Taken Last Year." Buffalo Evening News [Buffalo, NY] 6 Jan. 1900: 1. Print. "New Bath House Is Now Open." Buffalo Evening News [Buffalo, NY] 3 Jan. 1901: 1. Print. "New Free Bath's Big Record." Buffalo Evening News [Buffalo, NY] 16 Jan. 1901: 5. Print. "New Public Bath." Buffalo Evening News [Buffalo, NY] 28 Mar. 1899: 1. Print. "No Tracks to Be Laid on Utica St." Buffalo Evening News [Buffalo, NY] 25 Sept. 1899: 1. Print. "Permit For Shed Given Central." Buffalo Courier [Buffalo, NY] 29 Jan. 1901: 8. Print. "Polling Places." Buffalo Courier-Express [Buffalo, NY] 19 Sept. 1939: 20. Print. Smith, H. Katherine. "A Good Listener." Buffalo Courier-Express [Buffalo, NY] 6 July 1941, Six sec. : 2. Print. Smith, H. Katherine. "Public Baths Here Set Two Precedents." Buffalo Courier-Express [Buffalo, NY] 31 Aug. 1952: 8-C. Print. Smith, H. Katherine. "Towel Rentals Tell Story Of Financial Ups and Downs. "Buffalo Courier-Express [Buffalo, NY] 16 Jan. 1938: 12. Print. Szymborski, John G. "Renting Upstairs." Personal interview. 2000. "Three Resolutions Filed By Franczyk." Buffalo Courier-Express [Buffalo, NY] 18 Sept. 1964: 28. Print. "Too Far Gone For Repairs." Buffalo Evening News [Buffalo, NY] 1 Aug. 1899: 1. Print. Witul, Gregory L. "Buffalo’s Polonia: A Brief History." American Council for Polish Culture. 66th Annual Convention, Buffalo, NY. 31 July 2014. Lecture.